I am extra, extra excited to share this blog post with you! 12pm: It's Monday 21st March and the weather is singing! I get ready at home and head out on the Overground to meet my friend and photographer for the day, Aaron! We meet at Hoxton station and make our way to the venue by foot. Luckily my shoes weren't too high-heeled for the cobbled pavement! 12.15pm: We arrived at the quirky, trendy, under-arches studio venue. The venue itself had a cool vibe to it and was open and bright. 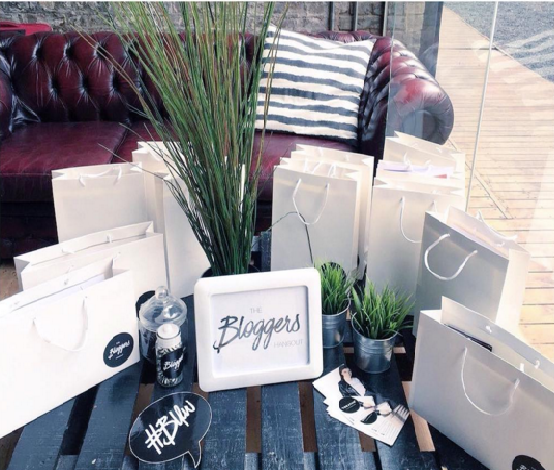 We were greeted by a selection of Blogger Hangout goodie bags which were filled with little treats and beauty gifts! First stop, "Leighton Denny", a beauty brand that started off doing nails but have now ventured into self tanning, perfume and make-up. We spoke to one of their reps for a while who was super friendly and we had a good natter about my self- tanning fears! If you are like me and are worried about the "Tangoed" effects of tanning, this brand promises to help you build a natural and golden tan. I can't wait to try for myself! 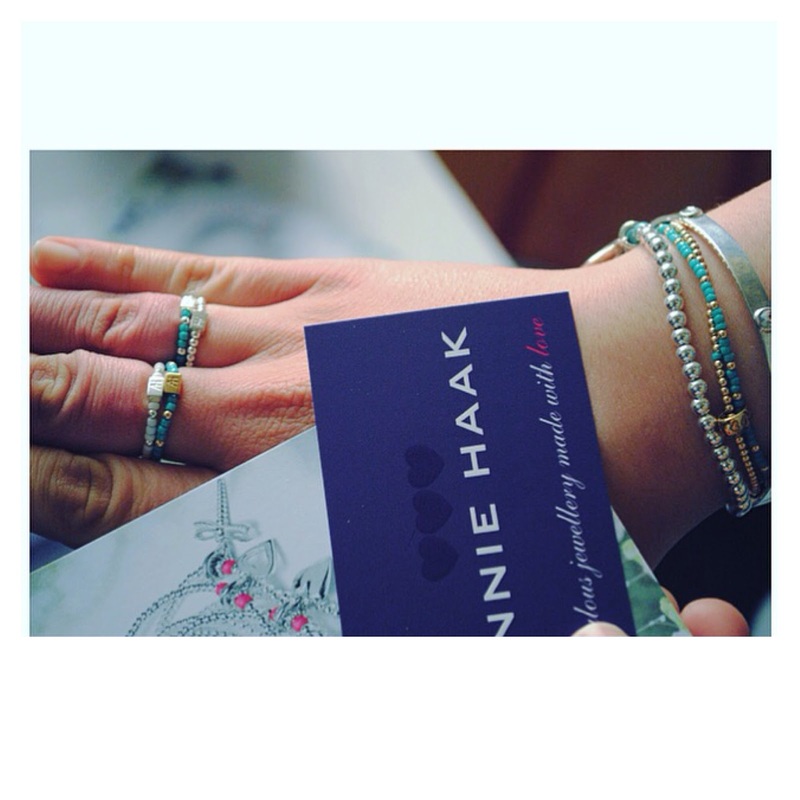 12.30pm: Next up, we headed over to jewellery company "Annie Haak's" stall to 'Build Our Haak Stack' (love that!) I entered a competition to win my stack by snapping and posting a pic on my Instagram! Fingers crossed! This brand has a wide range of elasticated, beaded jewellery in lots of colours; something for every taste and size! 12.40pm: I got chatting to the lovely ladies of "Monu Skincare" which is a skincare line. If you read my recent Holland and Barrett’s post, you will know that I have been struggling a little with my skin recently. These products are supposed to be simple and effective. They smell GORGEOUS and contain a lot of natural ingredients. Monu Skincare was really generous and I received a load of products to take home and use myself! There will be a review of these products soon! 12.45pm: HAIR O' CLOCK!!! I had been waiting patiently and my time had finally come; to get my hair done by the lovely Tom Gilling at the "Hair Tools" stand. I had a really good convo with the Yorkshire-based team about hair care and hair dramas! In the end, Tom created this WONDERFUL 60's inspired up-do by blowing my hair out and then pinning into a low bun with a few bits left out. This is a style I would have never been able to try on myself and he did a brilliant job! Thank you Tom! 1pm: Time to head into the second section of the event. "SECOND SECTION you ask?!? Yeahh buddy!!! So down a little ramp and through a brick archway we arrived in another section full of stalls and people. 1.05pm: We had a brief chat with the ladies at the "Paul Mitchell" stand. They were super friendly and spoke to me about their salon-based products. I came away with some fab products to test which will also be going into a review! 1.15pm: Another drinks stand. This time, from "The Protein Drinks Co." I got chatting to one of the guys about their brand and current successes (top seller in Tesco) and how they are trying to change misconceptions from people about what a "protein drink" is. I was one of those sceptical people who shied away from the words "protein shake", however I would be really interested in trying this drink when I'm on the go and feeling peckish. I imagine it would curb my hunger, without the naughty calories of a chocolate bar in the afternoon! I am hoping to get a small supply to give this a go for a week and document the results! 1.20pm: Smells, glorious smells!!! I could smell the "Kenneth Turner" Stand from across the room as they were burning beautiful scented candles and soaking reed diffusers. The smell attracted me initially, but the actual designs of the candles are stunning. Each one is embedded in a curvaceous vase which could even be used once the candle burns out, or as the ladies put it "the gift that keeps on giving". The design and overall product feel makes me think that they would suit almost any home and make a really special gift. The lovely reps allowed us to smell the entire range of Kenneth Turner candles and take one home in the form of a hand cream! I chose “Bubbly” because it smells fresh and sweet. 1.25pm: Curls, Curls, Curls!!! The gorgeous girls at “The Curl Company” had some great advice for my curly curly hair! I tend to use quite a lot of heat on my hair, so need products to restore any damaged bits and give strength and shine! TCC generously gave me a bunch of full- sized bottles from their dry hair care range for me to try and review! I LOVE hair masks and anything that leaves my hair feeling soft, strong and manageable. I will be back here to talk about my Curl Company experience soon! 1.30pm: Last but not least, the wonderful Vegan- friendly, cruelty free skincare brand "Amie Skincare". This brand was started by Fiona Parkhouse for her daughter who suffered from bad breakouts as a young teen. Yet another brand who I could really use right now to repair and get my skin back to its child-like state of glowy youthfulness! (Not too much to ask right?!) :p Review to follow! Pheww, well if you got through all of that, it was almost as if you were there with me! I hope you are looking forward to the reviews; I am certainly looking forward to working my way through all these gorgeous products! Thank you to Blogger's Hangout for organising this fab event and for all the brilliant brands for being so lovely and generous!